When you consider that these days most webmasters own more than one site, then it just makes good sense to have a powerful script that will handle multiple ads on multiple websites. Why? So you can easily increase your income passively. Let's face it... If you aren't inter-promoting your websites on each site that you own, then you're missing out on extra income! If you have any websites that receivea lot of traffic, then this is an affordable revenue-generating script that will work automatically for you to promote your own offers and websites. At the very same time, you can also offer extended value advertising services to your site visitors to promote their offers for a fee. With this powerful script, you can offer attractive text ads and banner ads, with the further capability of also offer scrolling text ads and scrolling banner ads! Mouse-over pause enabled when someone points at an ad included. Discover just how popular these forms of advertising are once you install it to your website and start receiving orders from eager advertisers. Don't get left behind your competition... Secure your copy of this must-have script today, and you can have it up and running in next to no time! Don't know how to install scripts to your main website? No problem! We can do it for you at no extra cost. If you don't have a website of your own, then maybe it's time you considered starting up one so you can make more money online today. Simply check out our script store for plenty of money-making scripts to suit all niches. Easy ad package management of text ads and banner ads on single or multiple websites. Create your own ad packages for different banner sizes/text ads, numbers of views and length of time from the easy-to-navigate admin area. Paste in a small snippet of code on the website/s you want to display your ads on. 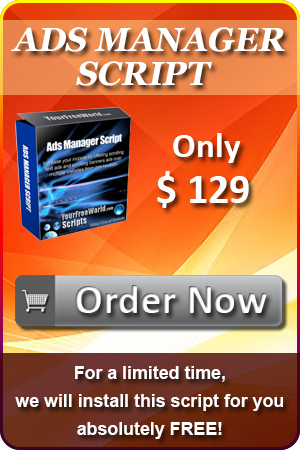 There is no limit to how many websites you can add the script to! (No prior programming knowledge required either). Approve/Reject/Delete ads from the admin area. Order Tracking feature for advertisers to login and view the real-time statistics of their order/s. Paypal and Payza compatible with the ability to add 5 more merchant accounts of your choice. Customise the order approval email. 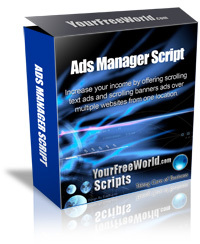 Set your personal YourFreeWorld.com Scripts Affiliate ID to earn $20-$50 commissions from script sales from your websites. Grab Free Self Signed SSL Certificate. Look nowhere beyond YFW Hosting to secure your website and benefit from first-rate hosting services. With Inbuild Push Notification Service to instantly update all your app users. Look nowhere beyond InnateApps.com to have a mobile app with Inbuild Push Notification Service to instantly update all your app users.